It couldn’t have happened on a more perfect day. I heard a “Moooom…. it’s 7:40!” As I reached for the iPhone, I realized not only did the alarm not go off as planned, my son would be very late for school. Groaning while I threw off the covers, a quick glance outside stopped me in my tracks. Snow flurries were dancing in front of the window, and I knew right then that I also wouldn’t be driving either. It was a snow day! Our first snowfall of the season! 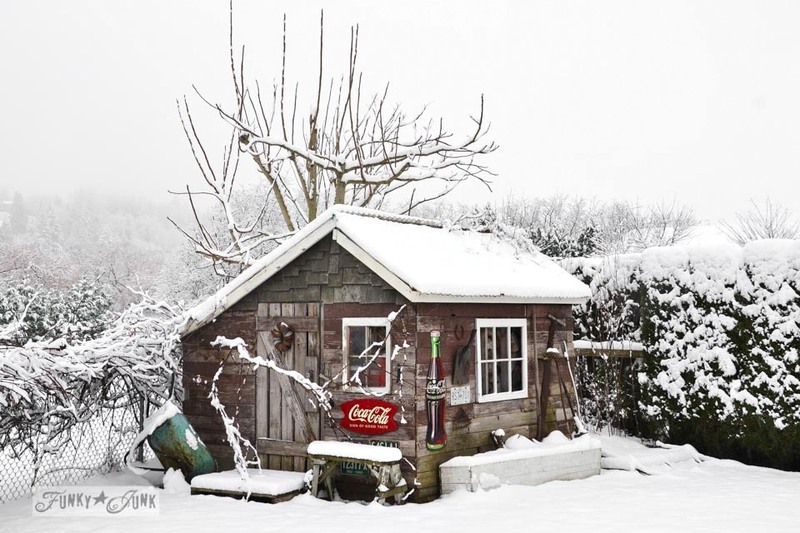 And my rustic garden shed caught in the snow required a 2013 photoshoot pronto! Before the snow melted. 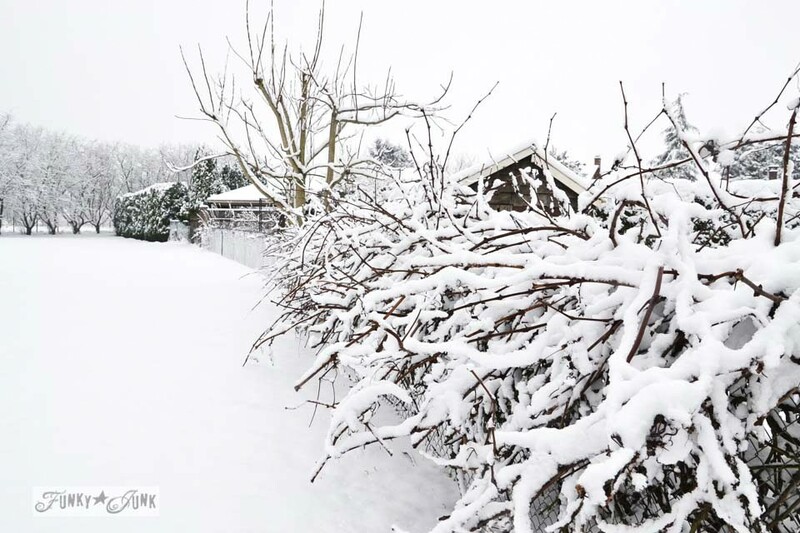 Love the look of those grapevines laced with snow. Just beautiful! From my Merry Christmas winter wonderland shed to yours, Merry Christmas, friends! May your season be filled with extra special moments with those you love. Visit the story of the garden shed HERE. Stunning photos, Donna ! Merry Christmas ! How BEAUTIFUL! Thank you for sharing your world…Happy Holidays to you and your son! 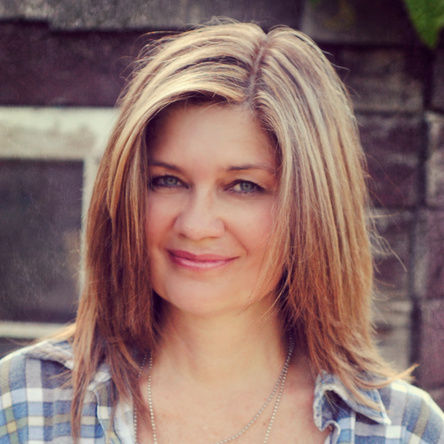 Hi Donna, Thanks for your lovey blog! 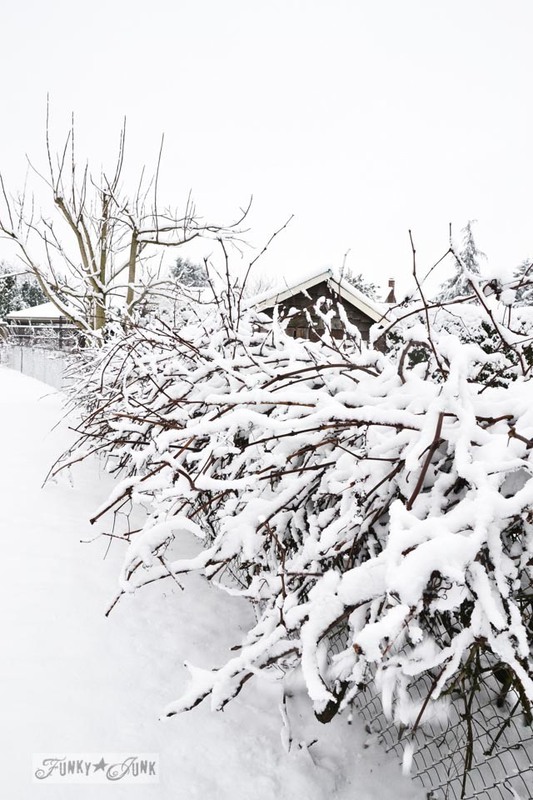 Love your snow pictures. Happy Holidays! 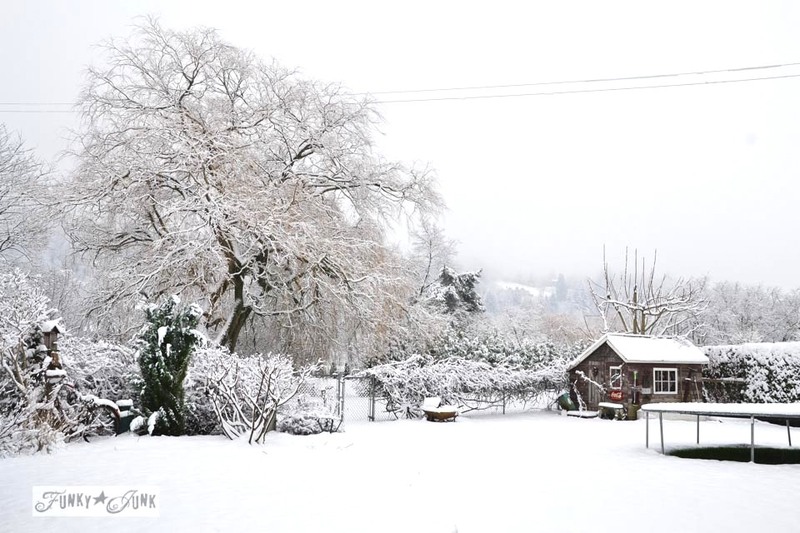 Your winter wonderland looks so beautiful, Donna! I can picture a snowman, decorated with some rusty parts :). Merry Christmas to you and your son! Enjoy the holidays! Merry Christmas to you and your family too! I always enjoy your blog even If I don ‘t comment. You inspire me lots! The pictures are beautiful ! Thanks for braving the outside and sharing. Have a wonderful holiday season with your son. Beautiful photos!!! We are having a “brown” Christmas this year in Nebraska! Merry Christmas to you! 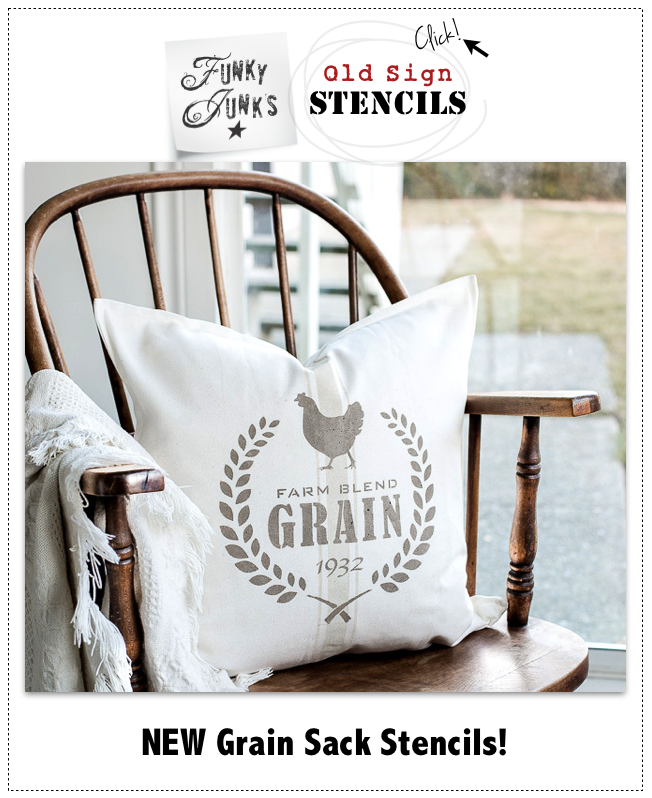 Those pictures are postcard perfect! 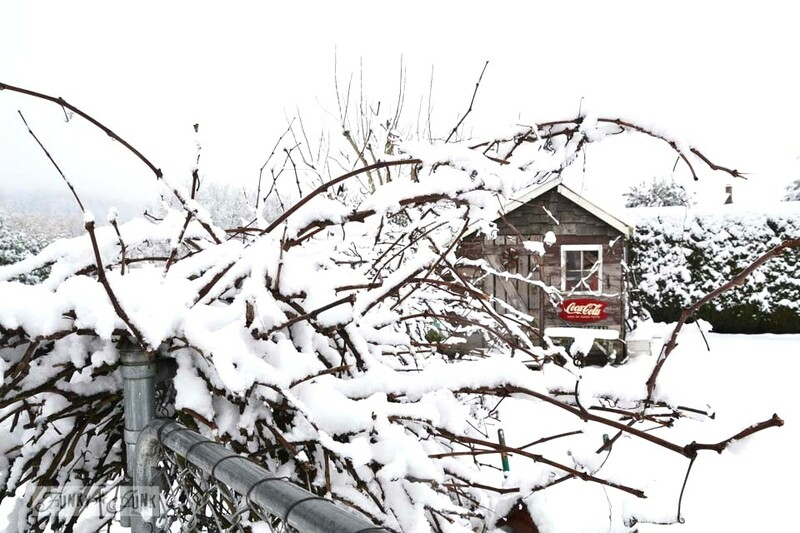 Beautiful, beautiful photos… perfect Christmas Eve shots! Merry Christmas! I love all phases of your shed. Looking forward to a new year and your Funky Junk postings. Your little shed is beautiful, and the scenery is gorgeous, you really have an eye for photography. Merry Christmas and a Happy New Year to You and your son. 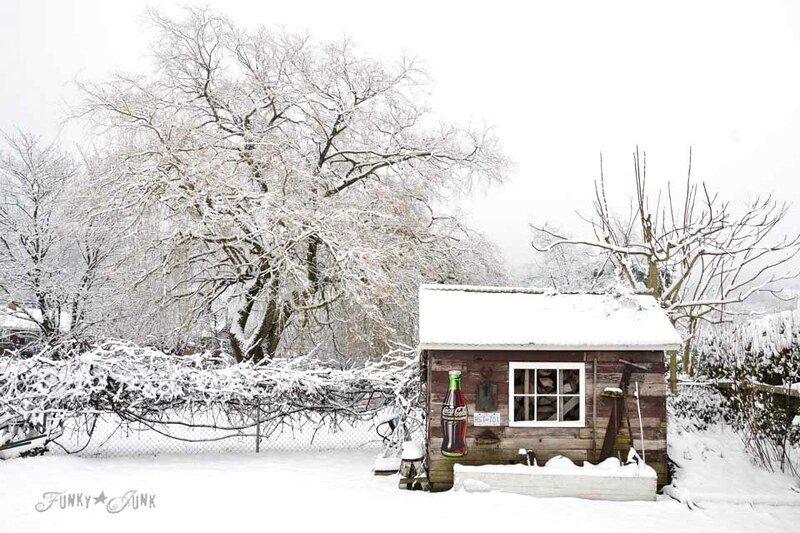 Is it at all sick that I could look at pictures of your shed, all day, in any weather or season? I either need a FunkyJunk shed calendar, or an intervention of some kind. Merry Christmas, and may all your dreams be rusty! Merry Christmas Donna!!! May all your wishes for 2014 come true! 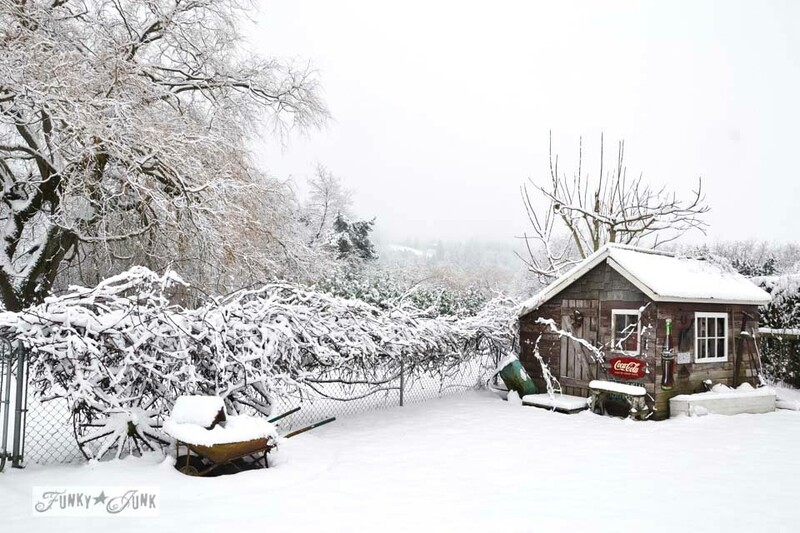 Donna – beautiful winter wonderland! Merry Christmas. 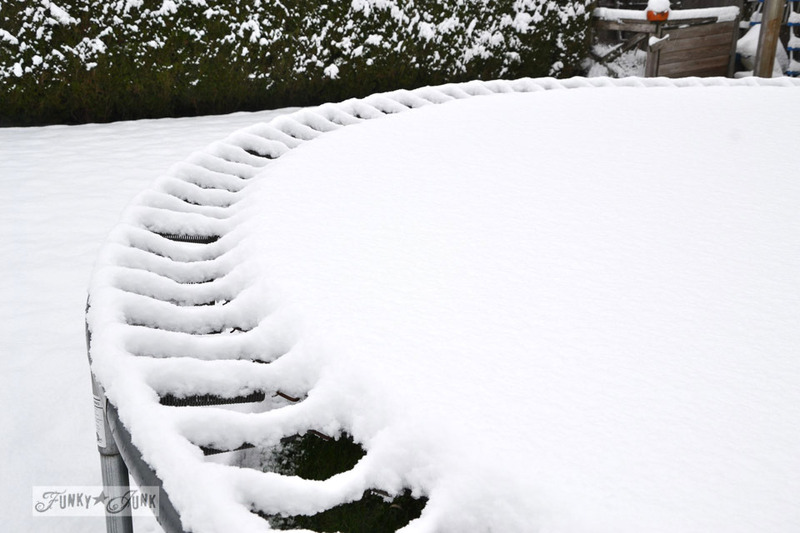 Love your snow photos! I can see why you were so happy it had snowed! It makes everything look different. You have a great place to live. Merry Christmas Donna…..to you, your son and your beautiful fur babies! GOD bless you today and everyday!!! Perhaps Santa will being him his own alarm clock for Christmas! Or do all teenage boys use their cellphone as alarm clocks? Oh my GOODNESS! That is soooo gorgeous!!!! Isn’t God’s creation just amazingly AWESOME! Thanks for the beautiful pictures! Merry Christmas! Photos are awesome. Glad I’m viewing from a distance as it looks very very cold. And a Blessed Yuletide to you and yours!! 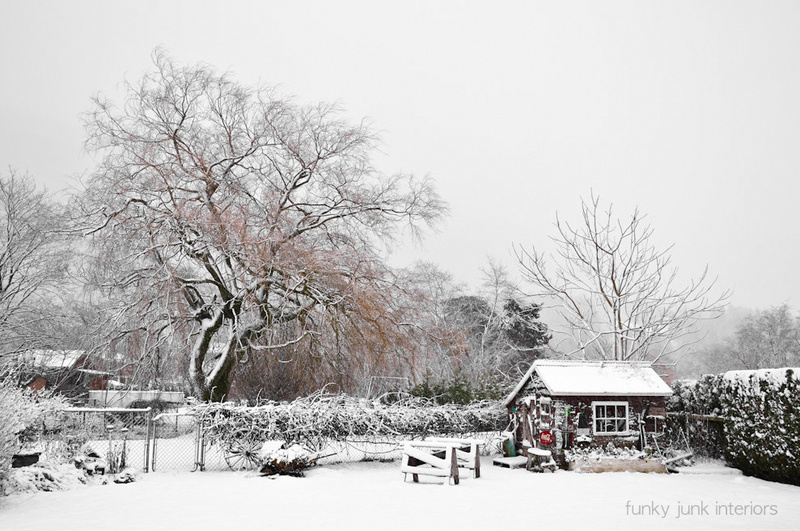 I have always loved your shed and what wonderful pictures of the shed and your “winter wonderland”. Merry Christmas to you and your family! It looks wonderful! Merry Christmas! I LOVE your blog! Your creations are phenomenal and I am going to copy some (if that is okay) for my own home – though I am afraid they won’t be quite as creative as yours. Thank you for sharing. Have a WONDERFUL Merry Christmas! 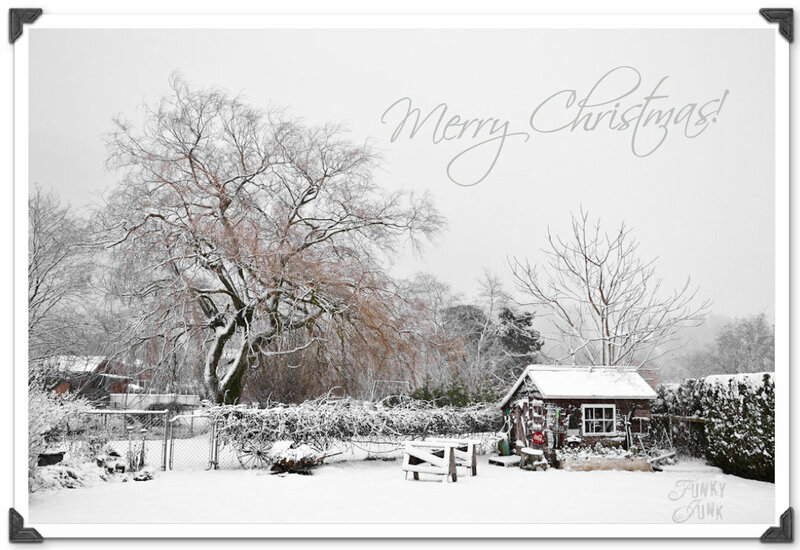 A beautiful, snowy gift! Merry Christmas, Donna! I have just read through all the comments, and have noticed how many people have commented on your photography skills. And that comment wishing for a calendar using your photos…hhmmmm!! Wishing you and Cody a wonderful Christmas Season. Merry Christmas, Donna. Thank you for a great year of blogging, pictures, projects, and introspection. Blessings for a new year of health, prosperity, goodness and grace. Your back yard is beautiful! Merry Christmas! 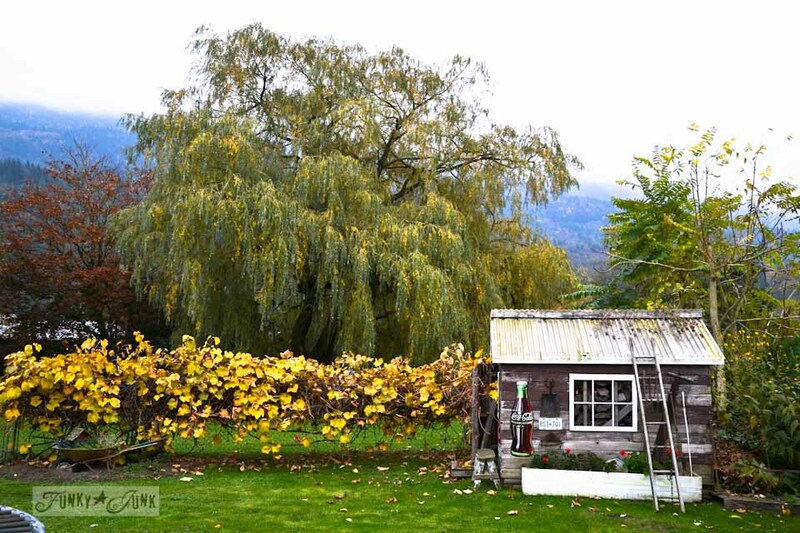 Hi Donna, Love your garden shed…it’s a work of art ! If you fine it missing, it’s because I worked some magic and got it to my backyard in the mountains of Virginia !! Love your blog !!! We are so likeminded when it comes to junk…so many possibilities. I was gonna say…”looks like a post card” ..but you knew that already! Beautiful photos Donna! I hope you had a Merry Christmas! 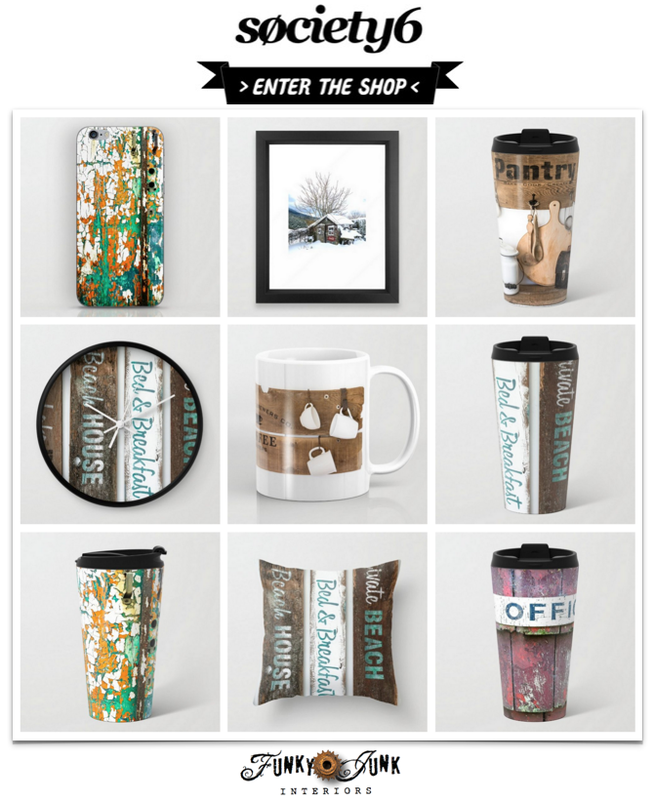 Can you purchase these prints with the coke cola on them? My basement is done coke cola memorabilia. My mom is 86 years young and this is her most favorite thing in the world. I love the birdhouse the most in these pics actually…lol. 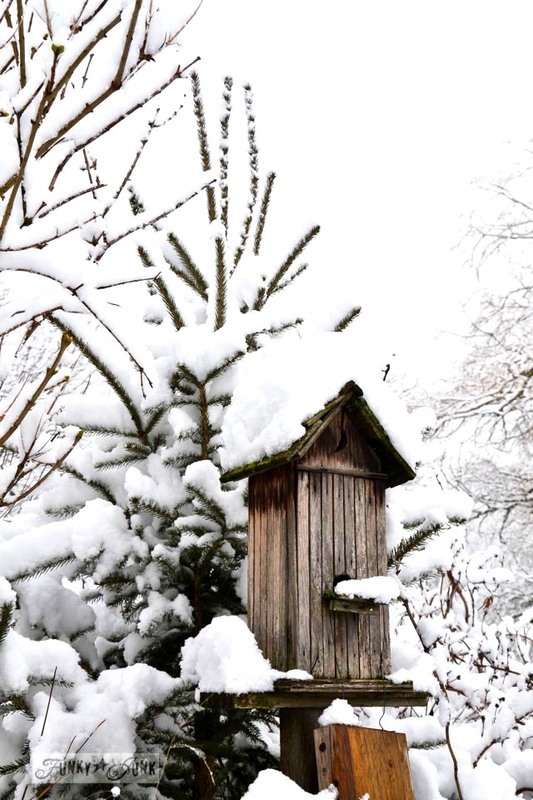 A while ago, you had placed a stepladder inside your Christmas tree and placed a plain wooden birdhouse on top. While I loved the entire effect, it was the the beautiful old birdhouse that inspired me (with VERY little previous experience with any power tools) to make a couple of my own ‘vintage’ ones. Before I found your blog approx. 1-1/2 yrs ago, I did not have anything like enough confidence in myself to either use a power tool, nor create anything for my home. So, THANK-YOU Donna!! You have opened up a whole world of possibilities, both for myself, and for untold others as well.